Like other cockroaches the American roach Periplaneta americana enjoys warmth and moisture, under and around sinks being a favourite hiding place. These cockroaches grow to around an inch and a half in length. For free advice, quotations and surveys please call us on 0800 046 7433 or email us. Firstly we must discover the scale of the infestation so as to decide on the best course of action. To determine how bad an infestation is or if there is one, a thorough survey should be undertaken, searching in cupboards, behind cookers, fridges, under sinks etc. Sticky board insect-monitor traps with pheromone attractants can be a good way to identify numbers and location of harbourages. Entering a room early in the morning (2am’ish )and quickly turning on the lights will often find some scurrying around (worth noting which way they run). Another more professional indicator is to use a flushing agent into crevices and holes etc, This will drive them out and locate their preferred harbourages. There are two main ways of dealing with cockroaches - spray treatments (including ULV) and baiting them. We use a micro encapsulated bait which gives the roach enough time to return to its harbourage before succumbing to the active ingredient. 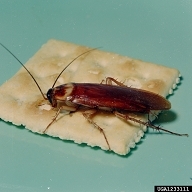 This has the effect of essentially placing a bait (the dead roach) exactly where the other roaches are hiding. This creates a domino effect and is a highly effective treatment for these tough to beat creatures. Both sexes have wings, the males wings extend down beyond the abdomen, whereas the female's ends flush with the abdomen. Females carry their oothecae (egg capsule) for less than a day normally and will sometimes ‘glue’ it close to a food source. Females will produce one oothecae per week and lay up to a staggering 90 in a life time, each oothecae contains between 14 and 16 young who can reach maturity in five months providing conditions are good. Cockroaches are vectors for some wonderful diseases including; Salmonella, Gastro-enteritis, Amoebic dysentry, Tuberculosis, Tape worm and Hookworms.